At EES I work with Students, Teachers, Parents, and outside resources. a. Individual Counseling-Students experiencing personal, social, or academic difficulties that interfere with school success can self-refer or be recommended by parents and teachers. b. Group Counseling-Students can sign up (or be referred by parents/teachers) for lunchtime focus groups that are held throughout the year for grade levels 2nd-5th, and do not interfere with classroom core instructional time. Some examples: Study skills, Friendship skills, Anxiety, Grief, Impulse Control, Anger Management, Divorce/Family Change, and more. c. Referrals for outside counseling services available upon request. 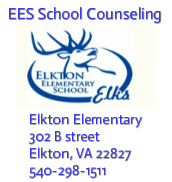 d. Mentorship opportunities available by parent or teacher referral, partnering EES children with JMU students for weekly friendship visits at EES to assist with school work and social interaction. B. Consultation-I meet with teachers, parents, the Student Study Committee, other caregivers, and agencies about concerns impacting students. C. Coordination-I serve on a variety of school committees including the Safe School and Effective School-wide Discipline Committees (Behavior reward systems), ASSIST, and chair the Volunteer Committee.